Paul is in a coma, said the person calling. The doctors think this is the end. His wife Jenni wants you to come. She wants everyone there around her. Their girls are at a friend’s house. I stood outside our girls’ elementary school and looked at the yellowed oaks. This was not the plan. Two weeks earlier, Paul had been telling jokes at their kitchen table. He had accomplished a great deal in his life. He headed the Equal Employment Opportunity Commission, worked for President Obama, and held a named chair at the University of Washington law school. Paul had cancer, but he also still had unfinished business. He wanted to record stories of his life for his two girls, ages six and ten. And my girls had planned an afternoon for us of molasses-ginger cookies and the playground. Half of life is showing up. We show up because abstract principles—friendship, love, support—motivate us. Or so I thought. I thought that thinking precedes actions, and that abstract ideas come first and motivate what you do. I was raised Protestant, and I grew up with the Protestant suspicion of “empty ritual.” Religious practices express the underlying beliefs and ideas, rather than creating these feelings. You show up because they are your friends. Or so I thought. I called our babysitter, changed my plans, and went to the Millers’ house. Paul lay unconscious in a hospital bed wedged into their bedroom. He looked asleep but more palely distant than a sleeper—or perhaps that was my mind, deciding that a coma looked different from sleep. I folded laundry to keep my hands busy. The house had lots of distracted people in it—someone in the kitchen, someone at the dining room table, me in the laundry room. After laundry, I sat down and waited. In a couple days my survey class in religion would talk about the Holocaust. We read the German rabbi and Holocaust survivor Emil Fackenheim, who struggled to understand the meaning of the Holocaust. So I re-read Fackenheim. He rejected the claim that G-d was punishing the Jews for their sins. Fackenheim wrote of a ‘Voice of Auschwitz,’ like the ‘Voice of Sinai’: a new revelation that spoke out of the Holocaust. This Voice commanded Jewish survival, Jewish empathy, and Jewish unity. The phone rang every few minutes. Someone brought bagels and cream cheese. Food and illness. During Paul’s illness, the Millers’ friends bought a freezer for their outside shed, and we took turns leaving food in it. Later someone came into the kitchen. “This is the end,” she whispered. “Jenni wants everyone there.” We edged into the room. It was silent. The words had emptied out of everyone’s heads. What do you say? What could anyone say? Sitting at Paul’s head, his childhood friend began the kaddish, the mourners’ prayer. The kaddish filled the gap. May His great Name grow exalted and sanctified in the world that He created as He willed… Blessed is He, beyond any blessing and song, praise and consolation that are uttered in the world. The kaddish opened up that horizontal space beyond any blessing and song. Birth, death, weddings, coming of age, graduations: these are all “liminal,” which means literally “on the threshold,” the limen. We stand halfway between one room and the next. These liminal moments are hard to manage. We do not know what is in the next room. Rituals give us something to say when we are speechless, when we watch someone move from one room into another. May His great Name grow exalted and sanctified in the world that He created as He willed… Blessed is He, beyond any blessing and song, praise and consolation that are uttered in the world. Arguing with G-d is part of Judaism. There is a famous Jewish story, a midrash, in which the rabbis of antiquity are arguing with each other. One rabbi appeals to G-d to prove his point: “If I am right, let the walls of the house of study fall down!” And the walls fall down. Then the rabbis turn on G-d and tell him to stop meddling. “You gave us the Torah. Go away! Now we get to argue about it!” In other words, G-d will stop intervening in human affairs. The age of prophecy has ended. But the best part of the story comes as an appendix. Someone asks more or less, “How did G-d react to the rabbis telling him to go away?” Instead of being angry, G-d laughs. He laughs and says, like a rueful parent of teenagers, “My children have defeated me. My children have defeated me!” G-d gave us the world, and now we get to argue about it. Yet the kaddish claims, Blessed is He, beyond any blessing and song, praise and consolation that are uttered in the world. A student once complained, “I can’t stand it! The second you get to a point when you’ve got G-d up against the wall, they answer, ‘You just can’t understand. G-d transcends human understanding.’ It shuts down debate. It’s unfair!” The kaddish answered, G-d gave you the text and now you can argue with it. You can argue with me, the kaddish. But all your words are less than G-d. “Where there is no conflict, no ambiguity, we have not ritual but ceremony,” the historian Geoffrey Koziol writes. The kaddish was about conflict, not resolution. You can participate in a ritual even as you disagree or disbelieve. I did not say anything out loud during the kaddish. I publically assented and privately resisted. And all the time the house smelled of toasted bagel: All this grief, Karamazov, and pancakes afterwards. Why is Jenni slicing bagels two hours after her husband has died? More importantly, why am I worrying about freezing the bagels? Here we stand peering into the next room where Paul has gone alone, beyond any blessing or song–and I worry about how to keep the bagels fresh. And where did the Jewish rituals of death end and the rest of living begin? It was hard to tell. They shaded off into everyday life. Paul’s friend Anna and I stood in the kitchen and looked over the house: people in every room. “Someone’s got to feed all these people,” Anna said. Anna went to Costco. She bought roasted chickens and mixed greens and paper plates and cutlery and plastic cups. I made balsamic salad dressing. My practicality horrified me. People have to eat! All this grief, Karamazov, and roast chicken from Costco afterwards. Jewish custom dictates that someone stay with the body continually. We stood around in the room with Paul’s body and talked quietly. Being with a dead body was not uncomfortable. The body was Paul, and he was clearly not there. Someone made me laugh, and then I stopped laughing and looked at Paul. “He would want us to laugh,” someone else said. Someone always says this at a funeral. The ritual—the practice—kept bringing us uncomfortably up against the fact of his death, like a boat banging against the dock in the wind. The anthropologist Victor Turner said that ritual ‘stores and transmits’ information. The information is death, and we have gotten the message. Or do I get the message? The next morning, before the burial, we were all waiting at the funeral parlor at the cemetery, again in small groups. Someone made a joke and I laughed. Another person looked at me sharply. We stood on a hill with a flaming tree, the lake and the mountains beyond us. The gravediggers cranked down the coffin and then released it from its ropes. Paul’s body lay inside the coffin, but I was not sure it was Paul. “It is Jewish custom for everyone at the graveside,” the rabbi explained, “to put two shovels of dirt on the coffin. You do the first one with the shovel upside down to signify reluctance. The second time, you turn the shovel right side up, to indicate acceptance,” the rabbi explained. Paul’s six-year-old daughter took the shovel from the rabbi’s hand. Jenni helped her lift the shovel. 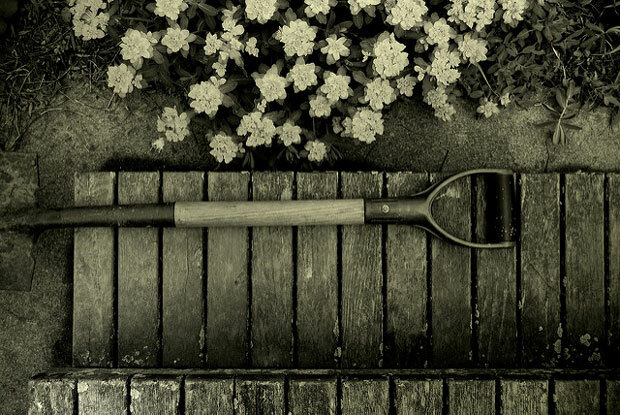 His ten-year-old daughter lifted the shovel and shoveled the dirt on her own. I think she did. I could hardly watch. The eye distracts itself: this tree shedding its orange leaves everywhere and the blue sky like the terrifying horizon. But I could not help but hear. The dirt banged against the coffin. Maybe I understood it. The ritual pushes you towards the new place in front of you, even if you are not there yet, and even if you don’t want to say it. When my mother was five, she lost her mother. My mother says that she has never “gotten over it.” Do you ever get over losing your father? Is the presence of G-d a many-sided mystery? What does ritual “do”? Ritual is often boring. Church services can be boring. But now some friends say that they like to go to church just for the space to think. And this may be another function of ritual: to rope off time, to free it up for that thinking. There are slow parts in ritual, like waiting on a school bus for an elementary school field trip. But you usually can’t get off the bus. You can think about other things. Still, the noise and motion on the bus distracts you and drags you back. Sherry Ortner says that “any ritual worth its salt makes non-engagement difficult.” You are on the bus—you are at the service. You can’t get off. When I was born, I know my parents were scared. They looked down at this little shriveled child, and they wondered what my life would be like. Would I play ball? Would I have friends? Would I be able to do the things they dreamed that their son would do? . . . And I have played ball a bit. I have always had fantastic friends. I have had good jobs, and I have done a good job at them. Along the way, I have helped other people. I have a lovely wife and two beautiful daughters. I have had a marvelous life. And I just want my girls to know that everyone can, and must, live a marvelous life. Paul told his own story of his life. The duty of the survivors of Auschwitz, Fackenheim wrote, is to tell the story, so that people would remember. Ritual, said the anthropologist Clifford Geertz, “is a story they tell themselves about themselves.” When people give toasts at weddings and birthday parties, they tell stories or the edges of stories. In the rituals of arrival and departure, the awkward times when we move between one room and the next, other people tell the stories of our lives to us. And in telling these, they tell the story of their own social groups. “The rituals enact the form of social relations and in giving these relations visible expression they enable people to know their own society,” the anthropologist Mary Douglas wrote. Rituals tell only part of the stories. They shape the messy practicalities of our lives into stories we can tell. They give us morals and lessons. Everyone can, and must, live a marvelous life. But rituals round off the parts that do not fit. Rituals pretend to reassure but they still do not solve the questions. Certainly, blessed are you, but where are you when the six-year-old loses her father to cancer? There is no story. So rituals tell stories even when the story makes no sense. After Paul’s service, more food in the synagogue basement: strawberries, blueberries, lox, bagels, roasted asparagus, food everywhere, children racing around. My cell phone rang. “This is Cloud City Coffee Shop. It’s closing time. We have a pile of exams in a binder with your name and phone on it. We thought it might be important.” I had nearly lost all the midterm exams for a large survey class. I have always worried about losing exams. But then- I looked around back down the stairs—was it really so important? The funeral takes your plan, tears it apart, and puts it all back together in the proper order, in which things stand in their proper perspective. Victor Turner said that rituals destroy and remake the cosmos. But maybe he was wrong. Maybe grief and fear remake the cosmos. Only after I take Cecilia to the emergency room, or when we walk past a long line of sick children and parents waiting to see a doctor during a flu epidemic in Cambodia: only then do things re-size themselves to their correct proportion. In all this disorder, the rituals only provide an illusion of comfort. They give an apparent plan. They tell us what song to sing. Perhaps no story exists. Perhaps no song should be sung. You have to stand in a long line to understand the many-sided mystery. At shiva the members of Jenni and Paul’s synagogue came—the same people who had filled the freezer with food and brought meals and driven the girls to school and helped with housework and yard work. If half of life is showing up, the synagogue showed up. We have all known the long loneliness, wrote Dorothy Day, and we have learned that the only solution is love and that love comes with community. And when people do not belong to religious groups, other groups—the families from the kids’ soccer team, from the kids’ school, from a parent’s workplace—show up. They bring lasagna and do the yard work. Religious ritual, in its intense practicality, accepts that humans need to eat. From Thanksgiving to graduation to Passover to Thaipusam, most rituals involve food. In Myanmar we stumbled upon a Theravadan Buddhist party for girls who were being initiated into a Buddhist monastery for a couple months. A showgirl sang on a stage with flashing colored lights, and everyone was eating. Rituals involve food. A Jewish friend came home from an engagement party and complained, “Protestants! All booze and no food!” Show me a ritual not involving food, and I will show you a Protestant wedding reception done on the cheap. Religious rituals accept human hunger and include it as inevitable. They bring together the transcendent and mundane—the kaddish and the sliced bagels. Ritual looks different when you look at it from the kitchen and when you drive to Costco. Ritual is not just formalized action. It shades off into everyday life. Often ritual practice does not have clear boundaries. The funeral service moves to hummus and strawberries. The kaddish moves to bagels and roast chickens. And these unclear edges give us a place to go: to make salad dressing, to fold laundry, to distract the eye. The edges of the ritual are safer. They let you look away and out from that brutal blue sky and the tree inevitably shedding its leaves. On the last night of shiva, we shut Jenni’s door behind us—now not Paul and Jenni’s door, but Jenni’s. In the months that followed, I kept thinking, “Has it only been four months/nine months/ twelve months since Paul died? It seems so long ago.” Paul’s death was extremely final. It was final because the rituals made it final. The ritual forced you to listen: not just the kaddish, but the staying with the body, the burial within twenty-four hours, the service, the sitting shiva. The rituals changed how I felt and thought. As Mary Douglas wrote, “… ritual is more to society than words are to thought. For it is very possible to know something and then find words for it. But it is impossible to have social relations without symbolic acts.” Ritual forced me to hear the dirt against the coffin. When Jenni worried about doing everything so quickly, within 24 hours of Paul’s death, one of his Orthodox cousins told her, “Do it. You will feel so much better when it is over.” Holding a funeral very quickly meant that many of Paul’s friends could not fly to the West Coast in time. But in the end, the many rituals—the kaddish, the sitting with the body, the burial, the service, sitting shiva—each of these walked us a few steps forward. In the end, we closed a door and we knew it was closed. The house was now Jenni’s house and Jenni’s house only. Paul did not live there anymore. Ritual—always a verb, not a noun—has its way with us. It takes us up in one place and leaves us in another. Rituals can tell our stories. They can reinforce social structures. They communicate information. They move us from one room to another, over the doorstep from one place and another: birth, coming of age, marriage, death. They do that within a community, who shows up to watch that and to look into the next room. And we argue and think within and against the rituals. In one of the most famous stories from the Holocaust, a group of Jews in Auschwitz held a debate about whether G-d was dead. They concluded that either G-d must not exist or that G-d had deserted them. And then they went to their evening prayers. Rituals are the kaddish you say when there is nothing to say in the world that He created as He willed. And they are the kaddish you say when the room is empty and the mourners have gone home. See generally Victor Turner, especially “Liminal to Liminoid in Play, Flow, and Ritual,” repr. in From Ritual to Theatre: The seriousness of human play (New York, 1982). Sherry Ortner, Sherpas through their Rituals (Cambridge, 1978), 6. Clifford Geertz, “Deep play: notes on the Balinese cockfight,” Daedalus 101 (1972), 1-37, here at 26. Mary Douglas, Purity and Danger (New York, 2003), 129. Victor Turner puts it more elegantly, “I came to see performances of ritual as distinct phases in the social processes whereby groups became adjusted to internal changes… and adapted to their external environment.” From Ritual to Theatre, 21-22. Douglas, Purity and Danger, 77-8. In describing rituals as process, I am indebted to Catherine Bell, Ritual Theory/Ritual Practice (New York, 1992) and Bell’s work on ritualization. An argument against ritual is that it reinforces inequality and power structures—as, for instance, only male priests preside at Catholic mass, or that male Buddhist priests in Thailand give ritual blessings. This is true: but the underlying problem is society, not the ritual. And people can and do resist ritual and those power structures, as the theorist Catherine Bell has noted. At graduation students wear flip-flops under their robes, decorate their hats, shake the president’s hand and leave a frog in it, and toss beach balls onto the stage. We are not passive in ritual; we are active agents, even if we cannot change the basic structures. Greta Austin is Professor in the Department of Religious Studies, and Director of the Gender & Queer Studies Program, at the University of Puget Sound. She has published a monograph, Shaping Church Law around the Year 1000, numerous scholarly articles on medieval Catholicism, and essays in forums like the American Scholar. Her work is available at http://ups.academia.edu/GretaAustin. You Had Me at Beheading! © 2014 Pangyrus.com. All rights reserved.